I listened to your webinar on Writers: Prepare Your Taxes Properly. I am not sure if I will have income this year from my book as it is due out either in December or January. I have expenses of $5,500 so far this year. I also had similar expenses last year but never filed anything. How would you advice me? Thank You ~ your book looks wonderful and I’ll be sure to get a copy. It will be a blessing to many writers! Congrats on the upcoming book. Since you didn’t claim your expenses last year, you could go back and amend your tax return, but instead I recommend that you accumulate those expenses as start up expenses. You can deduct up to $10,000 in start up expenses on your tax return in the year you start your business. Any extra start-up expenses can be deducted over time (180 months). I am assuming your business start date is the date your book is released. 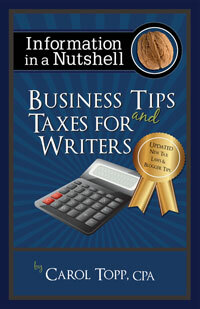 Business Tips and Taxes for Writers has some tips on tax deductions you can take and advice on keeping good records. When can you deduct book research expenses?